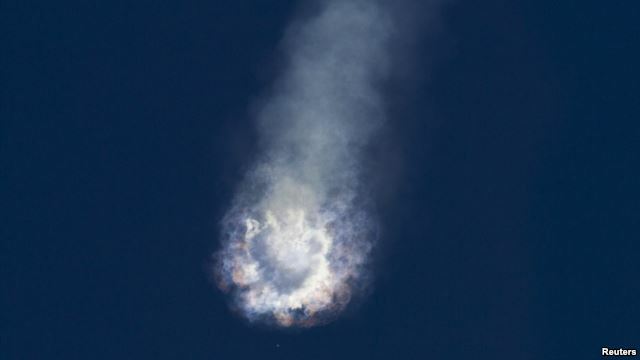 CAPE CANAVERAL, FLORIDA -SpaceX on Monday was searching for what destroyed its Falcon 9 rocket after liftoff over the weekend, leaving customers still loyal but unsure when their satellites might fly. The privately-held company, owned and operated by technology entrepreneur Elon Musk, has flown 18 successful missions with the Falcon 9 before Sunday's failure. Preliminary analysis pointed to a problem with the rocket's second-stage motor liquid oxygen tank, SpaceX said. "There was an overpressure event," Musk wrote on Twitter after the accident. "Cause still unknown after several thousand engineering-hours review," he added on Monday. Falcon 9 debuted in 2010 after SpaceX experimented with a smaller predecessor booster. "There's a huge, huge question about the cause of this failure, not from a point of view of finger-pointing, but for understanding if we should expect new vehicles to operate reliably from the beginning," said Carissa Christensen, managing partner of The Tauri Group, a Virginia-based space and technology consultancy. In the past, new rockets typically failed several times in their early missions, as engineers perfected designs and tweaked operations. With better computer modeling and computational tools, as well as more spaceflight experience, that paradigm may no longer be true. SpaceX has nearly 50 launches, worth more than $7 billion, on its schedule. "I don't think the accident is going to cause a mass move away from SpaceX," said Christensen. "It will be one more fact companies fold into their decisions and their negotiations, but it's not going to be the only fact, and it's certainly not going to be the most important fact," she said. Current customers include NASA, which uses Falcon 9 and SpaceX Dragon cargo ships to fly supplies to the International Space Station, and about 20 commercial and other satellite operators, many of which have contracts for multiple flights. Sunday's accident destroyed the Dragon cargo ship bound for the station, a $100 billion research laboratory that flies about 260 miles (418 km) above Earth. "We were the first [commercial customer] to use SpaceX in December 2013 and have never regretted taking that important step," said Markus Payer, vice president of communications with Luxembourg-based SES, which had booked an August Falcon ride for an Asian communications satellite. SES and other satellite operators said they were waiting for more information about why the Falcon failed, what corrective action might be needed and how long it would take before launches resume. "It is unfortunate, but we don't have any concerns about our commitment to fly on Falcon," Iridium Communications Inc , which has contracts for seven SpaceX launches, wrote in an email to Reuters. "It isn't critical that they make the exact dates - there is some flexibility in our overall launch plans," added Iridium spokeswoman Diane Hockenberry. With prices that are 25 percent to 30 percent less expensive than competitors in Europe and Russia, privately-owned SpaceX has brought the United States back into the commercial launch marketplace. Rival United Launch Alliance (ULA), a joint-venture of Lockheed Martin and Boeing intends to add commercial customers to a schedule now almost completely devoted to U.S. military missions. "Very sorry to hear of the [Falcon mission] loss," ULA Chief Executive Tory Bruno wrote on Twitter. "Heart-breaking for the men and women who worked on the rocket and its missions. Hang in there SpaceX." The accident was the third supply ship to fail in eight months. NASA's other supply line, operated by Orbital ATK , had a launch accident in October. Orbital's Antares rocket is being refurbished with new engines and expected to return to flight next year. Meanwhile, Orbital bought an Atlas rocket ride from ULA to launch its Cygnus cargo ship to the station before the end of the year. Russia lost a Progress cargo ship in April after it failed to separate properly from it Soyuz rocket. A reflight is slated for Friday. The only other supply ship flying to the station is Japan's HTV.